“Rumour Cubes’ sound is a luminous re-imagining of very many constituent parts” (Louder than War). 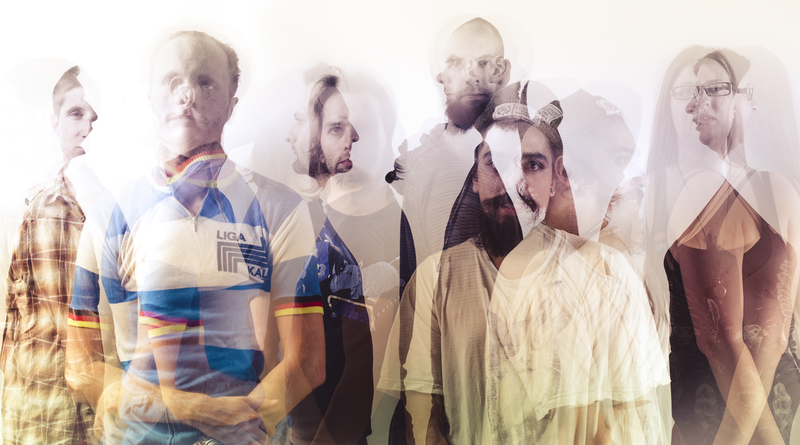 The London-based six-piece are a gathering swell of strings, electronics and layers of guitars, underpinned by a bass-infused rhythm. Formed in 2009, the band have since cut their own path, crafting music that is by turns melodic and abstract, raucous and reflective, joyful and melancholy. The band’s two albums Appearances of Collections (2014) and The Narrow State (2012) draw on a wide range of instrumentation, influences and ideas, both packed with Rumour Cubes’ signature changes in pace, texture and form. Appearances of Collections has been described as “a far-reaching and fearless work, a dizzying instrumental adventure” (The Skinny) and “music overflowing with a delicate, but nonetheless significant, passion” (Drowned in Sound). Rumour Cubes’ performances are underpinned by their love of new technology. The band’s live shows often feature mi.mu gloves (guitarist Adam Stark is part of the development team), which allow the wearer to manipulate sound using hand gestures, alongside a host of other technological elements, including joysticks, samplers, synths and a huge array of effects pedals, many of which are custom-built. Adam has also written custom software to synchronise videos to the band’s live performances, turning their shows into a multimedia experience. Since their inception, the band have collaborated with poets, film-makers and a wide spectrum of other musicians. Collaborations with poet Steve Willey can be found on debut album track The Gove Curve and the 1871 / Letters To Palestine release; and Appearances of Collections includes contributions from 10 guest musicians. In 2013 Rumour Cubes played at Glastonbury, Village Green and Truck festivals alongside Sam Duckworth (Get Cape. Wear Cape. Fly). The set at Glastonbury was Sunday’s headline act on the Leftfield Stage, and was a live mixtape with artists including Billy Bragg, Kate Nash, Sweet Billy Pilgrim, Jehst, Riz MC and Grace Petrie. Rumour Cubes are Joe Bartlett (bass), Jay Malhotra (guitar), Hannah Morgan (violin), Terry Murphy (viola), Omar Rahwangi (drums) and Adam Stark (guitar, electronics).